Made of high quality and recycling material, safe and environmental friendly. Four dynamic lighting modes: Continuous ON/Strobe/Blink and OFF. Great for Car; Party; Camping; Bar; Halloween and Christmas Decoration. ✔ READY FOR ANY SHAPES: The light wires are 3m/9.84ft long, its thin diameters makes it can be twist and twine to any shapes; Easy to be fixed, one glue gel is enough for the wire fixation. ✔ SEPARATE STRANDS OF EL WIRE: 5 EL wires are gathered by one splitter, you can connect or disconnect all by yourselves in one second, fast and convenient. 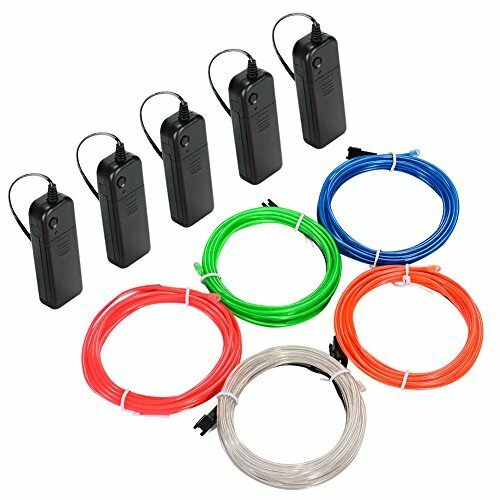 ✔ 5 COLORS IN 1 KIT: Red, Blue, Green, Pink, White wires for you to choose, each wire is 9.82 ft long. EL wire is not a series of points, but produces a 360 degree unbroken line of visible light. ✔ BATTERY POWERED PARTY LIGHT: Put two AA batteries in as power source, convenient and fast, no extra wires or plugs needed; Making the light portable and efficient. ✔ ECO FRIENDLY LIGHT FOR FUN: The EL wire is bright and much energy saving than normal lights; No heat radiation or environmental pollution.